There recently was a beautiful quilt done in browns and earth tones using the disappearing 4 patch design with a piano key border. Loved it! I have a supply of homespun fabrics that would look good in that but I question using homespun in a quilt because it is loosely woven. Does anyone have experience or comments? I haven't made anything with home spuns but I have sewed almost all my life. When I am quilting and I accidentally choose a loosely woven fabric, I either cut extra for the seam (think 3/8" seam) or I sew every seam with a full quarter inch and then do a wavy second seam from 1/8 to the 1/4 inch sewing line. I've most often done the second way because I didn't realize I was going to have a problem until I started sewing and the material started raveling. If you are thinking about doing the extra size seam, I would make a test D4P with larger squares than you normally would and see if it works out. Or you could take colored paper and do the same thing without wasting any fabric. I am looking forward to seeing your project. Edited to add: We used to use pinking shears to help with the raveling, but I find that pinked edge so confusing when trying to decide where I am supposed to be sewing. "grin"
Last edited by Barb in Louisiana; 05-16-2018 at 07:31 AM. I have some homespun in two quilts I made. It has held up as well or better than the "regular" quilting fabrics in them. When I made this quilt, which is all homespun fabrics except for the solid red, white and black in the sashing and pieced strips, I found that starch was an even better friend than I had realized before. Actually, I used Magic Sizing, but it works the same as starch. I didn't increase the seam allowances but did use a smaller stitch than usual. Can you direct me to a pattern for homespun rag quilts? I had one saved on my computer...I lost the pattern when my computer died. Daffy Daphne, what a pretty quilt! I love the southwest style quilts. This one is also a great guy quilt. 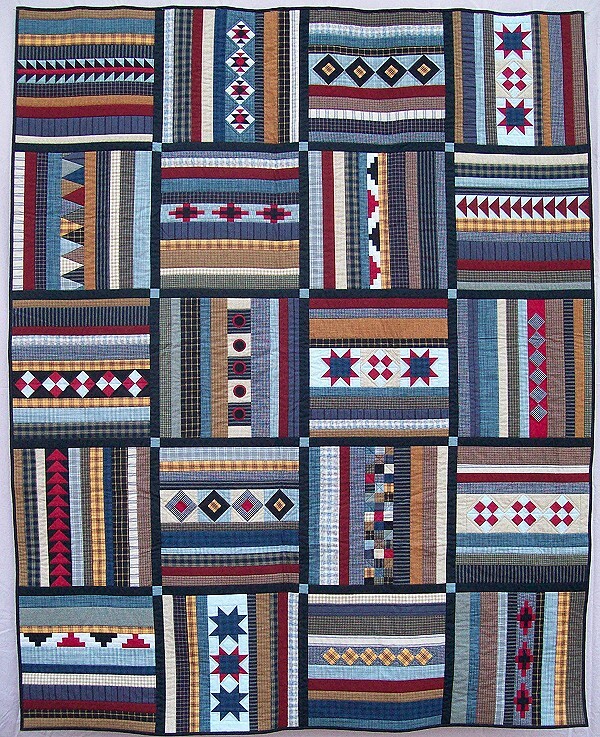 Is there a pattern name for this quilt? What size are your blocks? I'm guessing about 15 inches. Am I close? I typically use a 2.0 stitch for my piecing, with exception of paper piecing when I use a 1.6. Do you remember what size worked for you best? Edited to add: I never thought about the starch stiffening the fabric so that it would hold together better and not start the fraying process. Thanks for the tip. Last edited by Barb in Louisiana; 05-17-2018 at 03:33 PM. Made a rag quilt . first time I washed it, took to laundry mat. Thanks goodness i did. there was a basket full of threads and when I dried them it was a mess. Sure hope it didn't ruin the washer. never again. but with regular quilts It is fine. Daphne, I found the pattern. I am still interested in what stitch number you used. I am thinking a 1.8 would be tight enough. Thanks, Barb! I think 1.8 was my stitch length. The last time I used homespuns was a Christmas wall hanging and I promised myself - no more homespuns! I love them - the colors, plaids but man they just can't hold it together and seem to n stretch and stretch. So I'm just not going to them for quilts. I use it for rag quilts. Laundry mat washed and then dried there. Love it for rag quilts. I have made two quilts with homespuns, washed many times, with no problems so far. Of course, my sons are the caregivers of the quilts. No special treatment from men. One is on a couch, the other is thrown in the truck, used for hunting trips, washed and thrown back on couch. Did not think of seams coming apart when making, used 1/4" seams. Maybe because it has a muslin as part of seam? I have posted pics of both quilts, but not sure how to input them here. They are pics on phone.